Do you play football, basketball, lacrosse, soccer, baseball or softball, field hockey, rugby, ice hockey, water polo, roller hockey, handball, racquetball, squash, or volleyball? Do you participate in gymnastics, surfing, skiing, track and field, skateboarding, skydiving, weightlifting, wrestling, boxing, or martial arts? If so, the American Dental Association recommends that you wear a mouthguard! Whether or not you have braces, mouthguards can prevent serious trauma to your mouth and teeth during these activities. Our orthodontists in Cary and Raleigh can fit you for a custom mouthguard once you have completed your orthodontic treatment as well as for a “boil and bite” mouthguard during treatment. Store-bought mouthguards can be purchased at sporting good stores, large discount retailers, and drug stores. These ready-made appliances are usable right from the package and are the most affordable. Boil and bite mouthguards can also be purchased from sporting good stores, large discount retailers, and drug stores or our office. These require a bit more preparation. You have to boil them in water and then apply them to your teeth, molding the soft plastic around your teeth. Custom-made mouthguards are made by your experienced orthodontist in Raleigh. You’ll schedule an office visit to have a custom mold made of your teeth. A mouthguard is fashioned from that mold. This type of mouthguard offers the best protection and comfort but is a bit more costly than those you can purchase in a retail store. Fracture – this can be a root fracture, broken, or chipped tooth. The injured person should immediately get to the dentist. Any tooth fragments should be transported in milk, saline-soaked gauze, or under the athlete’s tongue. Avulsion – the entire tooth, including the root, has been knocked out. Handle the tooth by the crown. Do not scrub, brush, or sterilize the tooth. If it is dirty, gently rinse it with water. If possible, put the tooth back into the socket and have the athlete gently bite down with a towel between the teeth. Get to the dentist as soon as possible. Luxation – the tooth is still in the socket, but it is longer or shorter than surrounding teeth or pushed back or pulled forward. Go to the dentist immediately. They will gently but firmly restore the tooth to the proper position. Injuries to mouth tissue can happen when a strike to the face causes the athlete to bite down on their cheek or tongue. If you are wearing braces at the time, more serious injuries can occur if the braces are knocked from the teeth and protrude into the mouth. Ready-made mouthguards are good in a pinch, but they don’t offer the same kind of protection a boil and bite or custom mouthguard does. If you are purchasing a ready-made guard, look for the ANSI/ADA Seal of Acceptance on the packaging. This indicates that the mouthguard manufacturer has provided scientific evidence to the ADA that the guard will work as promised. Boil and bite mouthguards offer better protection because they are formed to your teeth. If you purchase one of these from a store, it is imperative that you follow the instructions carefully. Alternatively, you can bring your boil and bite to a Walton and Maready experienced Raleigh orthodontist who can help ensure the best fit. Boil and bite mouthguards are great for people undergoing orthodontic treatment because you will need them frequently as your teeth are moving and they are less expensive than customized. Custom mouthguards are the gold standard. They are made from a mold of your actual teeth. This means you have the best protection against injury with the most comfortable fit. Custom mouthguards are also more tear resistant and longer lasting. Whichever mouthguard you choose, it’s important to take care of it so that it continues to protect your teeth and mouth. 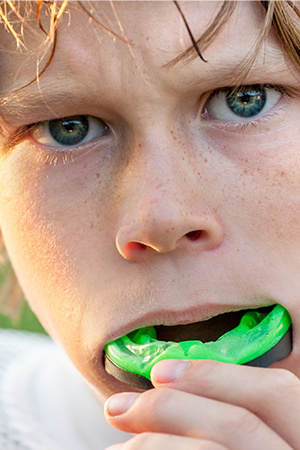 Here are a few tips on how to care for and maintain your mouthguard. Refrain from chewing on it. Do not store it in the car or direct sunlight. This may warp the plastic. Use toothpaste and a toothbrush to clean it after every use. Rinse with cold water or non-alcohol based mouth rinse before and after every use. Store in a clean, dry, rigid, and perforated case. Do not share your mouthguard. Remove any dental appliances (such as retainers, removable bridges, or dentures) before inserting the guard. Check the condition of the guard occasionally. If there are tears or holes, if it becomes loose or irritates the teeth or gums, it’s time to replace it. Much like a helmet, if you receive a strong blow to the mouth area, the mouthguard may need to be replaced to maintain a proper fit. Replace your mouthguard every two to three years. If it deteriorates in any way (cracks, splits, tears, or significant wear), replace sooner. Get fitted for a mouthguard today. You never know if or when a severe mouth or tooth injury will occur. Playing contact sports or participating in certain activities increase your risk. Though not always a requirement, wearing a mouthguard can protect you from costly and painful injuries. Mouthguards also ensure that your beautiful smile, and your investment in it, are much safer! Schedule a visit with Walton and Maready today to learn more about the right type of mouthguard for you.